I’m pretty sure it’s safe to say we are creatures of comfort. It’s not that we’re prissy about sleeping in a field, and god knows our camping was more comfortable than if we’d tried it by ourselves, but even so, it turns out I’m not really the outdoorsy type. 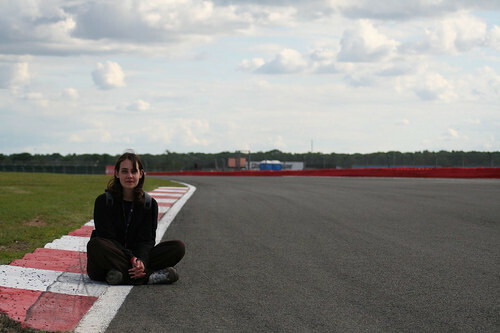 By the time we were ready to get going on Sunday, I was having a nightmare hair day (so much worse than a bad hair day), my lips were chapped and I was starting to re-think my grand ambition of following F1 round for an entire year. It wasn’t helped by the fact that we saw Vicki Butler-Henderson disappear into the portaloos and come out looking like a star. It probably brightened his morning, but not mine. 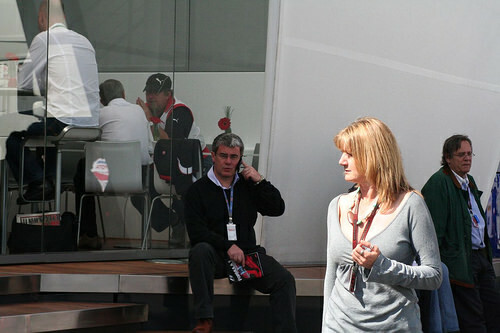 He also had a good start to the day, by being whisked off on a corporate tour of the pit lane. There was only space for one, and I was quite happy to remain behind, put my feet up and watch the big screen. He, meanwhile, went to see the Honda garage. Now, for inquisitive people like us, the tour wasn’t really up to scratch, but it was a good reason to be in the pitlane and have a scout around who was doing what and where. When he returned, we took our ready-made packed lunch (Honda were so good to us) and headed to the grandstands to grab our seats early. Imagine my horror/shock/dismay and his joyousness to see that VBH was sitting just a few rows behind us. 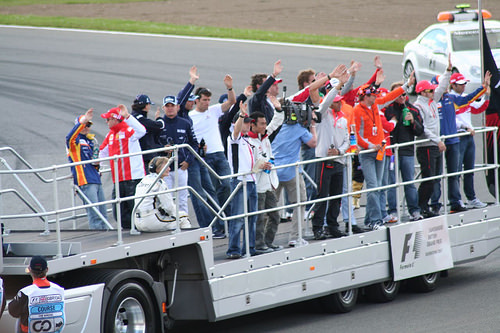 I found the drivers parade quite disappointing. There’s too many people cramped on the back of a lorry, and it’s too far away to be any use. Yea, they stopped and waved for a bit, but I would have preferred to see them in separate cars like they do at other tracks. The Red Arrows were still a man down from the Goodwood weekend (apparently a domestic incident ended with a broken wrist for one of the pilots) but they put on a pretty good show, somewhat terrifying, as all plane-related acrobatics are. 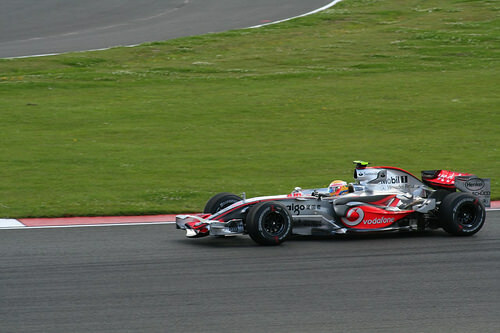 The race itself was good, we made maximum use of our Kangaroo TV and watched Massa pushing his way through the field. You could feel the collective slump when Hamilton’s bungled pit stop and bad strategy saw him lose the lead of the race, and I’d go so far as to say that several people even left early. We were not quite so fickle, and waited out the whole race, and more, so that when we finally left the grandstands, everyone else was fighting to get home. We thought about going to the BMW Pit Lane Park but all the other smart people waiting out the traffic had decided to do the same thing. So, we wandered aimlessly, until we saw some people on the track. I was quite shocked to see it. I hadn’t realised you could go on the track at all, and I wasn’t about to miss out on an opportunity like that. It probably sounds stupid, but even though it’s just regular tarmac (I did bend down to check it), there’s a kind of electricity from knowing what has taken place on it not an hour previously. There were people roller blading, on scooters, and bicycles, everyone making the most of the track. And who can blame them? 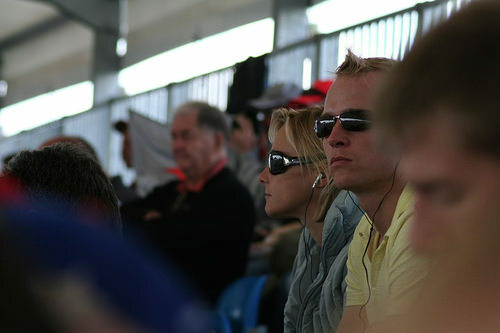 When it comes down to it, the whole point of going to a race is the atmosphere, the feeling of being near to the action. You don’t always know what’s going on or who’s fastest, but you can see things happen with your own eyes and it brings you so much closer to the sport. That being said, it started to rain, so we left. We thanked Honda profusely, again and again, and left with all the goodies they had given us. We still got caught in traffic, and arrived home completely exhausted. But, I wouldn’t have it any other way.